Pamphlet No. 60 set out the Board of Education's response to the proposals in the 1926 Hadow Report The Education of the Adolescent. Several sections of this pamphlet - the case studies and the Appendix - were printed in smaller type. I have not reproduced this here as it would have made the text hard to read on a computer screen. The sections concerned are between paragraphs 42 and 43 (pages 19-22), paragraphs 52 and 53 (pages 26-30), paragraphs 59 and 60 (pages 32-34) and the whole of the Appendix (pages 39-52). The New Prospect in Education was prepared for the web by Derek Gillard and uploaded on 27 December 2016. This pamphlet has been prepared, as explained in the Board's Circular No. 1397, in the hope that it may assist towards the solution of problems of organisation in connexion with the provision of proper educational facilities for older children. 1. The Hadow Report on the Education of the Adolescent has now been in the hands of the public for some sixteen months. Its main thesis - the provision for every child over the age of 11 of a system of intermediate education in schools set apart and organised for that purpose - was, of course, no new one. The Report indeed only emphasised and amplified the general trend of policy, which was outlined so long ago as January, 1925, in the Board's Circular 1350, and which since that date has become the generally accepted basis of all reorganisation proposals. Nevertheless, the publication of the Report was an event of first-rate importance, creating as it did a widespread interest in the problems discussed and focussing attention upon them. 2. We must recognise that mere administrative change is worthless, unless behind it there exist a real conviction and a new outlook. It would be too much to expect that the principles and implications of the Report should meet with immediate and universal acceptance. Admittedly there are very real difficulties, both professional and administrative, in the way of the complete adoption of its suggestions, but they. should not be allowed to blur the meaning of a generous conception or stand in the road of its realisation. the age of 11+ and a Senior School course from 11+ to 14 or 15. The cut between the two types of school is on the basis of age, and not of attainment or capacity, and it should be realised that any material overlapping of ages will cause not merely confusion, but possible chaos. 4. The claims of attainment or capacity are to be satisfied within the Junior or Senior School by variety of treatment. The function of the Junior School is comparatively simple. It is to prepare children for the more diversified development of the senior stage, that is to give them a mastery of the tools and elements of instruction, and to enliven and open their minds and interests for the more complex courses of the post-primary stage-whether organised in a Secondary, Technical, Central, or Senior School; its share, therefore, in the general system of education is one of great importance and dignity. 5. The function of the Senior School is, of course, far more varied. It has to devise varying courses of instruction for the main categories into which pupils will naturally fall. These courses may; differ in respect of objective or in difference of pace towards a common objective, but the course will be devised for the child and not the child for the course. It is impossible to exaggerate the significance of what we may call "the course idea". The success of a school will lie not in the retention of children to a particular age, but in the completion of the arranged programme for each child who embarks upon it. A school career is to be judged by the work accomplished in any institution, not by the number of years spent in it - a sermon does not compensate for its indeterminateness merely by its length. The success of the non-selective Senior School organised on these lines is, of course, dependent on our ability first to concentrate and then to classify the children. The intellectual opportunities so afforded are too obvious to need comment, but no less valuable are the new opportunities of corporate life and training. 6. So far the non-selective Senior School has, been under consideration, but scarcely less important is the creation of a new type of school for selected pupils. We want not only Senior Schools for all, but special types for selected pupils. What up to now, has been loosely termed "the Central School" is important because, along with the general advance, we may by its means feel our way to new forms or varieties of post-primary education. Every large area, therefore, should aim at having at least one of these schools. They will be our chief pioneers in the new ventures which are opening out for us, and an essential element in the creation of the new Modern School. 7. The question of curriculum is discussed in the Report with such detail that there is no necessity to refer to it further at the moment, since it is hoped at some subsequent date to take this matter up more fully. One warning is necessary: the Committee had their eye on a fully developed Modern School and, to begin with, the course of the ordinary non-selective Senior School will generally be based on less ambitious lines. attending Technical and Evening Institutes. Both tendencies will defeat the hopes which the present opportunity offers of raising a new harvest from a virgin soil, and they may only succeed in stereotyping and hardening what is still free and fluid. If we err at all, it should be on the side of caution. We must realise a new conception and leave to it every facility for varied growth. In the case of the Secondary School system built up under the Act of 1902, the present examination concordat followed, and did not precede, stabilisation of curriculum. To plunge prematurely into a general examination system for the new schools would be to reverse the process, to make the examination not the natural expression of a natural growth, but the imposed mould into which all growth must be fitted. 9. The first work of teachers and of administrators is to think out their goal, feeling their way towards an appropriate curriculum with an appropriate examination. In the meantime any examinations which are set up should be avowedly and deliberately of a temporary and tentative character, adapted to particular schools or groups of schools, but not formalised by the erection-of large examining bodies, who might easily become the masters of a system which they were created to serve. The Board are alive to the importance of devising appropriate examinations for the varying types of Modern Schools which may appear in the future, and they are taking steps to discuss the whole question with the various bodies and interests concerned. (1) That primary education should be regarded as ending at about the age of 11+, and that all children should then go forward to some form of post-primary education. (2) That this second stage should as far as possible be organised as a single whole within which there should be variety of types. (3) That legislation should be passed fixing as from 1932 the age of 15 years as that to which attendance at school should be obligatory. The first recommendation involves a drastic reorganisation of the existing Elementary School system and to give effect to it is the most urgent, the most immediately practicable and at the same time the most revolutionary of the tasks set by the Report. The present pamphlet deals only with urgent problems which have to be faced at once and within the limits of the existing system, and it is therefore concerned primarily with this recommendation. But the second recommendation also is of immediate importance, for, quite apart from any possibility of future legislative changes which it would be out of place to discuss here, its acceptance involves a high degree of co-operation between all bodies concerned with the different types of schools for adolescent children, and particularly between Local Education Authorities for Higher and Elementary Education in boroughs and urban districts where the Council is responsible for Elementary Education onIy. create facilities for the children now in these ordinary Elementary Schools to receive an education of the kind contemplated in the Report is a new task requiring a fundamental change in outlook. 12. It is true that the Elementary Schools have for many years not been content merely to provide an elementary education in the narrowest sense, as it might have been understood, for example, by the early pioneers of schools for the poor or even by those responsible for the early Education Acts, But efforts at extending the work have hitherto of necessity been directed in the main to the provision of more advanced instruction for a selected number of children. By the Education Act of 1918, Parliament required children to remain at school to the end of the term in which they reach the age of 14 years, removing the various exemptions under which children had left before that age, and laid on all Local Education Authorities the duty of providing practical and advanced instruction for the older children, including those who remain at school beyond the age of compulsion. This is the latest of many stages by which the age of compulsory school attendance has been raised during the last 40 years, but the process has been so gradual that at no time has it been generally recognised as requiring any fundamental change in the machinery or outlook of the ordinary Elementary Schools. The Report makes it plain that some very valuable work is being done for the older children in these schools, but that, when all children now attend school for at least three years after reaching the age of 11, it is in the highest degree wasteful not to recognise the claims of all these older children to-receive an education suited to their special needs. The problem set by the Report is thus essentially different from that which has given rise to the extension of Secondary School provision and to the establishment of the Junior Technical and the selective Central School. It is that of the adaptation of the existing Elementary School system so that all the older children, not a selected few, may receive an education suited to their age and special needs, practical in the broadest sense, and so organised as to allow for classification and differentiation between pupils of different types of capacity and of different aptitudes. 13. The Secondary School, as we now know it, must continue as a school in which all will follow a curriculum including a foreign language, mathematics and a scientific subject, and in which the course will be planned for pupils remaining at school till at least the age of 16, with definite provision for post-matriculation work by a substantial proportion of them. As more alternatives become available for pupils needing courses of different types, the more important will it be to maintain in their proper sphere the special standards of this traditional type of secondary education. 14. The Junior Technical School, varying in the details of its methods in different parts of the country, may be expected to retain its distinctive characteristic of providing an education with a strong bias in the direction of a definite industry or group of industries of local importance; and for this purpose it will always cultivate close relationship with the industries concerned. 15. The nature and extent of the provision made under these heads will clearly affect the methods adopted in any particular area for the establishment of Senior Schools for the great mass of the children. But the problem is itself distinct, involving as it does a readjustment of the existing Elementary School system, and being concerned in the main with the education of children within the period of compulsory school attendance. It is with a problem thus limited that the present pamphlet is concerned. emphasising the fact that a new stage in education begins at 11+, by transferring as many children as possible at that age, not merely to a different type of teaching within the same school, but to another institution with a distinctive staff and organised definitely for post-primary education. 17. Clearly the desired result will not be achieved merely by altering the boundaries between departments within the school, for only in the very largest schools will there be enough children over the age of 11 to form a separate, properly classified Senior School. We have now to conceive as the normal unit not the single school but the group. The first task is to contrive the creation of such groups out of schools designed, for the most part, on altogether different assumptions. 18. The difficult task of reorganisation will never be accomplished-or will be of no real value-unless it is based on a conviction of the value of the changes proposed, and on a clear conception of their purpose. It may, therefore, be worth while, before dealing with details, to summarise briefly the reasons which appear to justify the demand that the problems and difficulties of a radical change in organisation should be faced. The Report does not ignore the good work already done for the older children in many Elementary Schools, but its conclusion is that this good work is done under highly adverse conditions, and that teachers who attempt under the existing system to overcome the evil of "marking time" are faced with a task of extreme difficulty. Many gallant attempts have been made, but all the experience gained from them emphasises the advantage to be derived from an improved organisation. Teachers, who have been able to obtain good results under the old system, will have far wider opportunities for good work under the new conditions contemplated in the Report. 19. The need for a further break in the school course, apart from that between the Infants' Department and the main school, has in recent years become more and more obvious. The older children need separate treatment just because they are older both in body and mind; they have a more independent outlook in life; they no longer require to be trained only in the general elements of education that all must master, but they also ask for an education suited to their own individual needs and capacities. If our objective is, as has been said, "to prepare children for a life of active labour and social co-operation", it will be an enormous advantage if we can provide for their education during the last years of their attendance at school in an atmosphere and surroundings specially adapted to their needs, not hampered by the presence of younger children needing preparation and guidance of a different type. 20. The needs of children of different capacities have to be met in different ways or we shall 'fail, as they grow older, to awake in them that active interest so essential to true education. It is not sufficient to provide "advanced instruction" of a more or less literary type for a selected group of children, who would otherwise be "marking time"; it is also our task to meet the needs of those children, whose outlook on life is more directly practical, or who wish to turn to some form of constructive work. If we cannot adjust our curricula so that they meet these varying needs, the compulsory attendance of the child at school becomes a mere constraint, which may well prejudice him for all time against educational influences. If classes are reasonably small, much can, of course, be done under any organisation to adjust teaching methods to individual requirements, but only if the older children are collected in fairly large numbers in one school, will it, as a rule, be possible to provide alternative courses based on a clear recognition of the differences between children of different types. In a one-course school the child who should be following an alternative course becomes a. retarded pupil, preventing the school from organising even its one-course effectively. 21. In the Board's Circular 1350, issued in 1925, it was stated that "The age of 11 is increasingly recognised as the most suitable dividing line between what may be called junior and senior education. Its adoption for the purpose of school organisation tends to a clearer definition of the aims and needs of the curriculum, and facilitates the training of the children on lines appropriate to their ages." The same age is adopted in the recommendations of the Report; and there are important practical reasons for its acceptance. If the break be made later, the normal pupil, who leaves school at the age of 14, will not have a course in the Senior School long enough to give him results of permanent value. Even on the basis of a break at 11+, some of the children will receive all too short a course. If we fix an earlier age, most children will not yet have mastered the common essential elements, and it will be out of the question to carry out any process of selection; but 11 is roughly the age at which, under existing arrangements, it is most usual to select children for admission to Secondary or Central Schools; it is the age at which those children who are most advanced in elementary subjects will find it most easy to embark on a new study; if, for example, they are going to follow a course of reasonable length, it is a good age at which to begin the study of a foreign language or of Mathematics, or of Science on a more advanced syllabus. 22. Finally, in all but the most densely populated urban areas; Senior Schools must draw their pupils from a relatively wide area, if they are to be large enough to admit of suitable organisation. 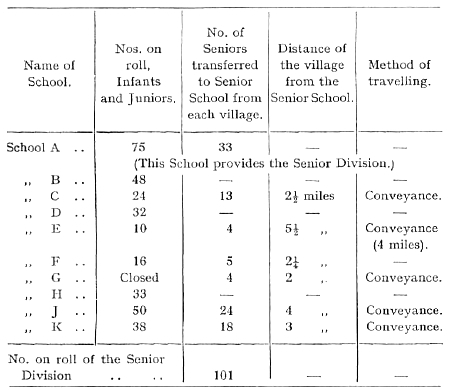 It is reasonable to ask the child of 11 to travel somewhat further to school than his younger brother or sister, and apart from the special difficulties of rural areas, it will usually be found possible to collect in one school enough children of this age to constitute a Senior School of reasonable size. But, with a lower age of transfer the schools would need to be nearer the children's homes and therefore more numerous; they would then contain fewer children in each age-group and classification would become more difficult. attempt to select children for different types of Senior School Classification at this age will, not, of course, be regarded as permanent in all cases, and it will always be necessary to transfer individual children at a later age from, one type of school to another. 24. In the first place, age is a better guide than scholastic attainments, for it is not true that the child who has failed to reach the school standard normal to his age can therefore best be taught with younger children. On the contrary, all the evidence shows that such a child will develop most rapidly if he is placed with other children of his own age in conditions which allow suitable special provision to be made for him. He needs the stimulus of a new environment, possibly even more than does the child of normal attainments, and his presence in a class of younger children is as harmful to them as to himself. Where schemes of reorganisation have been carried out on the basis of a strict age division, it is often these retarded older children who have gained most conspicuously by the change. Instead of being a nuisance and a source of irritation in a class primarily concerned with younger children, they come into their own and receive the attention that they deserve, and as a result they often develop unexpected abilities. It is mere waste of valuable time to leave these children in the Junior School till the age of 12 or 13; they, as well as the brighter children, should be transferred at the age of 11, so that they may get the benefit of a course of reasonable length in the Senior School. 26. It is important that children should be transferred from the Junior to the Senior School at the age and at the period of the year at which pupils are admitted to Secondary and Central Schools. Otherwise a child may be transferred twice within a period of 12 or 13 months, and the Senior School, instead of being able to concentrate on the provision of a coherent senior course for its pupils, will have a double objective; the organisation of the course is upset, if some children leave the school after two or three terms, and the attention of the teachers is distracted by the preparation of those pupils for scholarship examinations It is true that if children are transferred only once in the year there will be a difference of practically a full year in the ages of the youngest and oldest children promoted; but it will generally be found preferable to adopt this system, not only in order to avoid the double transfer of children going to Secondary Schools, but also . to enable the Senior School to organise its courses effectively. Pressure on accommodation has in some areas made it necessary to transfer children twice a year, but there are obvious difficulties in such an arrangement. 27. In order to obtain for all pupils a course of at least three years in the Senior School, some Authorities have fixed the age of transfer at 10½ to 11½; but it is of the first importance to secure that promotions to the different types of post-primary school should be made on the same basis and this will usually mean transfer at the age of 11+, i.e., at some point between the 11th and the 12th birthday. It is recognised that on this basis not every child will spend a full three years in the Senior School, but, if all transfers are made not later than the 12th birthday, the loss should not be serious, and it should be the aim of the Senior School to provide so good a course that children will remain to complete it. 28. The Report recommends the transfer of children not merely to "a different type of teaching within the same school," but, wherever possible, to a separate Senior School. It is this recommendation which requires the deepest changes in existing school organisation, and will in practice present the greatest difficulties. It is, therefore, desirable to emphasise the reasons which led the Committee to the conclusion that it was necessary to establish distinct Senior Schools, if the older children were to obtain full benefit from the educational course planned for them. 29. Mention has already been made of the advantages of providing such education in an atmosphere and surroundings specially adapted for the needs of older children. With small numbers, separation is not possible, and it will always be necessary to attempt to create this atmosphere by a change in the curriculum and organisation within the school itself. But wherever enough children can conveniently be collected, obvious advantages can be derived from an organisation under which one school, under one head teacher, has the single objective of providing for its pupils the best possible three- or four-year course, without the distraction of preparing a few children for a scholarship examination, or of guiding younger children over an essentially different stage of their educational career. In some cases the Senior School will be able to occupy new buildings specially erected for the purpose on a site of its own; in others it will be necessary to use an existing building, which may sometimes be one department forming part of a larger block. It will clearly be many years before new buildings are provided for all or even most of the children, and it is important in the meantime to use the existing accommodation to the best advantage, so that the Senior School is established as a separate entity under its own head teacher, and enjoys the best available facilities for free and independent development. 30. If the Senior School is not a separate entity, but also contains junior classes for children under 11, it cannot concentrate fully on its senior work; it lacks a single clear objective, and will be distracted from its main task by the presence of the younger children. Some of these younger children will be entering for Secondary School scholarships, and the school may even measure its success by the number of scholarships won, instead of by its own work for its own older children. 31. Finally, unless there is a genuine transfer to a new school or department, it is far more difficult to make an effective break in organisation on an age basis. In a school of the traditional type, with its continuous series of standards, it is extremely difficult to avoid promotion from standard to standard solely on the basis of attainments, although this is inconsistent with the suggestions in the Report as to distinctive provision for the older children. 32. Objection is sometimes mage to the proposed organisation by those who feel strongly the value of the continuous influence on the child of one school and one head teacher. This feeling is natural, particularly where the school tradition is strong; but continuity is already broken, when pupils are transferred to Secondary or Central Schools, and to most people it will seem more important that in the separate Senior School there are far greater opportunities for the older children to develop a strong corporate life, and a tradition more closely related to actual life. It is far easier to provide good organised games in a school with a large number of children of the same age, and in the Senior School atmosphere it is far more likely that school societies and Old Scholars' clubs will flourish and all those out-of-school activities which mean so much for the growth of a corporate spirit. content to judge a school by its examination successes. It is not a danger at all, if teachers are clear as to those wider aims and objectives which are the basis of all sound preparatory work. Where reorganisation has taken place it has sometimes been found difficult to secure good co-operation between the Junior and Senior Schools., but it is the almost universal experience that the Junior School, once established as a separate institution, receives a healthy stimulus and a definite aim. The general standard of attainment rises, and the brighter pupils make a rapid advance without "cramming". The school realises that it has to carry its pupils over a definite stage of their educational career, and that it has to reach, as far as possible, a definite standard. Such a conception gives sufficient purpose to the work without in any way restricting freedom. 34. It is necessary again to emphasise the importance of removing to Senior Schools all the older children. There is nothing more discouraging to a head teacher or more disastrous to the life of a school, than that a large number of the more able older children should be removed, and that the school should be left with the hopeless task of catering for all the younger children, and at the same time for a small number of the more difficult children over the age of 11. This is not the organisation contemplated in the Report. On the contrary, it contemplates Junior Schools which should provide a three or four year course with a clear objective; and in areas where reorganisation has been effected on this basis, with a clean cut at the age of 11, it has always been found that the Junior Schools have provided more scope for interesting and effective work than the corresponding standards in schools of the traditional type. The level of attainment has risen, and it has been found that the work required of the teachers is as interesting and exacting as that in Senior Schools. It can in some ways be regarded as even more important, as these schools have to provide for all children before any selection is made to determine to which type of Senior or Secondary School they shall proceed. 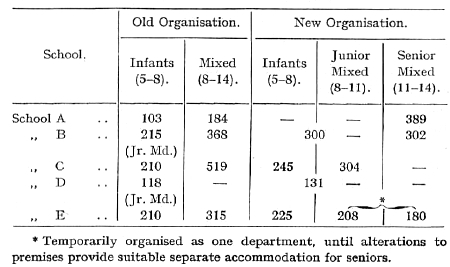 in 1925, expressed a preference for the establishment of "Junior Mixed and Infants" departments covering the ages from 5 to 11 years, in order to avoid the disadvantages of two transfers from one department to another. In the light of further experience it is not now possible to press this preference, and the balance of advantage would now usually be regarded as lying with an organisation providing separate successive departments for Infants and Juniors, so long as children are transferred regularly and systematically on an age basis and soon enough to allow them all to complete a course of at least three years in the Junior School. This makes it possible for the Infants' School to preserve its special methods and characteristics, which represent some of the most valuable features of the English educational system, while the Junior School can provide a sound preparatory course, can develop its own special methods for this stage of the work, and can acquire the separate status which it deserves. 36. There may in any area be special circumstances making it best to provide one department for all the children under 11; the numbers of children, the need for providing Junior and Infants' departments near to their homes, and the nature of the accommodation available will usually determine the details of organisation, and will decide, for example. whether the break between the two departments should come at the age of 7 or at 8; but every effort should be made to avoid a break at. 9, as under this arrangement the Junior School covers only two years of school life, and finds it very difficult to provide a satisfactory course in this short period. 37. It is hoped that no more need be said to show that there are very strong grounds for the adoption of the principles laid down in the Report, that a new stage in education should begin at about the age of 11+ and that, wherever possible, children should be transferred at that age to a new school. If these principles are accepted, it follows that the first and urgent need is for an improvement in the organisation of the Elementary Schools, and that it is therefore the duty of every Authority and every body of Managers to consider the problems raised by the Report, and in particular to decide what effect its recommendations will have on any immediate proposals for building new schools, or for the extension or reconstruction of existing buildings. 38. An improved organisation may be essential, but it is never sufficient to consider the problem merely in terms of organisation and numbers. A perfect scheme may be drawn up on paper, but if it is to be successful in practice it must not only provide better facilities, but must also he based upon the co-operation of children, teachers, parents and Managers. It is well worth while to take some trouble to secure this co-operation, even at the cost of some apparent delay, Teachers should be consulted as to the arrangements contemplated, meetings can be held, or literature circulated, or the Press used, in order to explain to parents and to the public generally the reasons for any proposed changes, how they will make possible a better classification, a wider curriculum and more useful practical work. When once the new scheme is in being, any necessary propaganda will be provided by the children themselves, and it is the general experience that any initial difficulties soon disappear; but experience has also shown that there may be objections to changes which are not understood, although parents are generally willing to make some sacrifices in the interests of the better education of their children, and that it is therefore wise to take some definite steps in the first instance to explain what is proposed. 39. In a Midland town where reorganisation has been carried out district by district, there was some trouble in giving effect to the first changes, because parents did not understand what was proposed; but, profiting by this experience, the Authority took care to make known as widely as possible their full intentions, before any further districts were taken in hand, and the result has been willing co-operation on the part of all concerned. In a County area where it has been particularly important to secure the co-operation of many bodies of Voluntary Managers in a scheme of reorganisation, special pains have been taken to explain fully the nature of the changes contemplated, both to the Managers and to parents, by public meetings and the like; and, as the scheme develops, a pamphlet is being circulated setting out very clearly the potentialities of the rural Senior School and the opportunities which it can offer to its pupils. 40. It will seldom be possible to reorganise an area completely without the inclusion of some Voluntary Schools, and it is therefore of special importance to secure the cooperation of their Managers by a full explanation of the advantages to be secured. The Consultative Committee expressed the hope that "the Managers of Non-Provided Schools would aid to the best of their power the development of Post-Primary Schools of the type for which they had suggested the name 'Modern'; and would help to establish the Modern School firmly as an integral part of our national system of Education." It is generally recognised that the non-provided schools should co-operate in any big scheme for the improvement of educational facilities, and it is the experience of a number of Authorities that Managers are willing to respond to the appeal of the Consultative Committee, if it is fully explained to them that a proposed scheme of reorganisation will further the interests of the children. So far as concerns Church of England Schools, an important step was taken by the National Society in November, 1927, when resolutions were adopted accepting in principle the type of organisation now contemplated. Successful reorganisations have as a rule been the result not of pressure from Authorities upon Bodies of Managers, but of wholehearted co-operation by Managers and Diocesan Committees who have appreciated the educational advantages to be gained. classification, and a scheme that provides a large number of small Senior Schools will not be giving the children the best opportunities. Where there are special difficulties, and no comprehensive reorganisation is possible, a pair of schools can sometimes be grouped so that all the older children attend one of them, forming a large enough Senior Division to make possible improved classification and advanced instruction. Such an arrangement is not, ideal, but it is at least a step in the right direction. 42. Nearly all the examples of reorganisation given in this pamphlet illustrate to some extent how non-provided schools have been affected, but some illustrations may be given which are of special interest in this connexion. They necessarily represent schemes devised in the main before the issue of the Report and in some cases under conditions of considerable difficulty. They are given as illustrations of results actually accomplished, and not necessarily as standards for imitation. I. The following table shows a reorganisation which is being carried out in a town with a population of some 23,000. It covers all the schools in the area except one Council School, one Roman Catholic School, and one Church of England School in an outlying district. All the schools shown are Church of England Schools, and the reorganisation is being effected by a grouping under Section 34 of the Education Act, 1921. 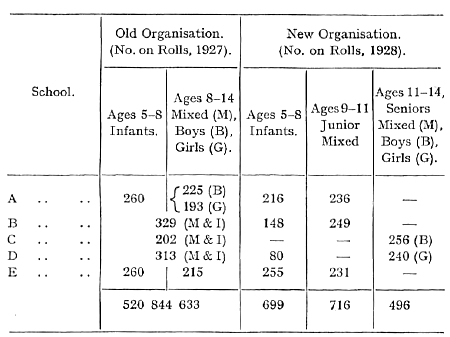 The figures indicate the numbers of children on the rolls of the schools before and after the changes in organisation. The expenditure on salaries of teachers before reorganisation was nearly 20 per cent above the average for similar areas, but each class in the schools covered normally the work of two standards or year-groups of children. As a result of the reorganisation, fewer teachers are now employed, all the senior children are in schools providing two parallel classes for each year-group, and the classification of the junior children is greatly improved. II. This residential town, with a population of some 35,000 and with some 3,500 children. in the schools, is administered by an independent authority for elementary education only. Except for a Roman Catholic School and one undenominational school, all the schools in this area are Church of England Schools, and these were all reorganised in 1927, by co-operation between the Authority and the Diocesan Committee, with the exception of a group of departments in an outlying part of the Borough. There are some 2,400 children in the schools affected. In the reorganised area there were previously 20 departments, of which 13 contained some older children, though none were confined to children over the age of 11, but all covered an age range from 8, or even 5, up to 14. The new organisation provides 17 departments, of which 6 are for children over 11, three for boys and three for girls, with some 120 to 200 children in each. The nature of the premises available made it necessary to provide this number of separate small departments, though it was recognised that it would make proper organisation difficult. In spite of the difficulties of proper classification, the new arrangements are already causing attention to be directed to the older children, whom the regular curriculum does not suit. There is no selective Central school. III. In this industrial town, with a population of some 42,000, a reorganisation was effected which covers both Council and non-provided schools. Some Church of England Schools previously taking children of all ages have now become Junior Schools, but there is still a Church of England Senior School in the centre of the town and accessible to any child. one non-provided) contain older children. Four of these departments are entirely for children over the age of 11+ (240 to 300 children each). while the other two each contain some 200 older children, but also a junior section. All are Mixed Departments . There was at the start some opposition from parents in an outlying area, but steps were taken to make it easier for children from this district to travel by tram. and the scheme is now working smoothly. There has been a slight reduction in the total number of classes. although all the schools provide much better grading. In the schools affected there were previously 24 departments. 14 of which contained children between the ages of 11 and 14, and it was the general rule in practically all of these for classes to be composed of children in two or three standards. Under the new organisation there will be a mixed selective Central School of 360 places provided by the Authority. besides the two Senior Schools already mentioned. and eight contributory Junior Schools. The main transfer from the Junior to the Senior Schools is made after the summer holiday, but some children whose birthdays fall in the latter part of the year are transferred in February. Children are normally transferred at the age of 11, and occasionally just before the 11th birthday, but as far as possible the Secondary School scholarship examination is taken from the Junior Schools. Senior Schools are all large enough to be organised in parallel A and B classes. but there have been considerable reductions in staff as a result of the reorganisation. Before the first considerable changes were made in 1922 in the schools on the lower level of the town, meetings of parents were held in every school affected. These were largely attended and afforded an opportunity of explaining the reasons for the proposed changes and gave parents a chance of asking questions upon doubtful points. The table overleaf shows the changes carried out and the numbers on the rolls under the old and new organisations. the age of 11. The provision of a Selective School is not justified, if it means that the unselected children are left scattered here and there in contributory schools, never enough in one place to constitute a good Senior School, with no opportunities for a course designed to meet their special needs, and constituting an effective bar to prevent the contributory schools becoming efficient Junior Schools. But if the Central School takes its proper place as one among a group of Senior Schools, that together take all the older children, its function is even more important than before. It is no longer an excrescence on the school system, but the recognised leader for the others. 44. It is of the first importance to provide the right amount of Central School accommodation in relation to the number of children in the area as a whole. If all the older children are to be transferred at the age of 11 to Senior Schools providing proper facilities for advanced and practical instruction, the function of the selective Central School is to provide for those children who stand out as possessing specially high capacity, and it is the general experience that difficulties follow, if much more than some 25 per cent of the children are selected at the age of 11 for admission to Secondary and Central Schools together. On the one hand, it will probably be found that some of the children selected are not of a sufficiently high standard, and their presence will then act as a drag upon the work of the whole Central School. On the other hand, if so many of the brighter children are selected, the ordinary Senior Schools are left with a very high proportion of their children belonging to the definitely duller types. If it is argued that these children gain from attending a school which can provide for their special needs, it can be answered that they gain far more if they can also mix on an equal footing with their brighter comrades in the social and athletic life of a school of which they both alike are members. Schools, which receive only the duller half or third of the older children of an area, tend to become labelled as "dud" schools, and this makes it all the more difficult for the children and their teachers to accomplish good work. Their difficulties will be all the greater if, as sometimes happens, the" dud" schools are badly accommodated and lack proper facilities for practical instruction. 45. It is the essence of a selective Central School that it should offer to its pupils a definite four-years course of study, and no more Central School places should be provided than can be filled by pupils who have a reasonable intention of remaining in the school for the full four years. 46. If the Central School is to be large enough to make possible a really good classification and some differentiation in curriculum, it will require to contain at least two parallel forms for each year of the course. Where there are not enough children, on a reasonable standard of selection, to provide a school of this size, it will as a rule be best to concentrate on the provision of advanced instruction in non-selective Senior Schools. If a selective Central School is provided in an area' administered by an Authority for Elementary Education only, it is important that there should be close co-operation with the Authority for Higher Education. This will not only prevent overlapping between Central and Secondary Schools. but may also secure the benefits of a Central School education for children from the adjacent parts of the County area, while sometimes an agreement on these lines may make it possible to establish a Central School in an area which could otherwise not provide enough children. many towns, on the other hand, it will be possible to provide large schools with three parallel courses, i.e., with an annual intake of 120 children in three forms of 40 each, and this will mean schools of at least 400 places. 48. It was stated in Circular 1350 that the Board were strongly in favour of separate departments for Senior Boys and Senior Girls, and there is no reason to depart from this view, but in less populous areas it may be necessary to establish Mixed Schools, in order to assemble enough children to form a separate Senior School of reasonable size. 49. In large towns, reorganisation will naturally take place district by district, and will result in the formation of groups of schools, but it is not desirable to lay too much emphasis on the geographical group or on co-operation between a particular group of schools. It is more important that there should be co-operation of a more general kind, i.e., that the Head Teachers of the area should agree on the aims and standards of the various stages of education. For this purpose, a conference was recently held in one reorganised area attended by the Head Teachers not only of the Senior and Junior Schools, but also of the Central and Secondary Schools. Each Senior School should be encouraged to develop on its own lines and parents should be free to choose at the time of transfer the Senior School which seems best to suit the needs of their child. Wherever local conditions make it possible, such an arrangement would be preferable to strict geographical grouping. and curriculum should be made at the age of 11+, so as to form a Senior Division into which children should be promoted on an age basis, and not merely on the basis of attainments as in the normal process of promotion from standard to standard. This will secure for the older children as many as possible of the advantages of a Senior School education, and, though there are obvious disadvantages in grouping them in the same school with the younger children, it will at the same time be easier to obtain a good head teacher for a larger school, and the larger staff of assistants will also make it easier for him to organise the work effectively. For example, a teacher mainly employed with one of the Junior Forms may usefully take some special subject in the Senior Division. 51. Schools with Senior Divisions of this kind will often be necessary to serve the villages of a mining or industrial area, but it will sometimes be possible in districts of this type to provide non-selective Senior Schools for all the older children, For example, in some parts of a northern mining county, new accommodation needed to relieve overcrowding or to replace defective buildings is taking the form of a new Senior School built midway between two villages, but within walking distance for older children. It is incidentally easier in this sort of area to find a good school site outside the actual centres of population. 52. Some examples of reorganisations actually effected may usefully be given at this stage, and fuller accounts of a few selected areas can be found in the Appendix. The organisations described cannot necessarily be taken as ideal, but illustrate the methods adopted by different Authorities to use their own particular opportunities and to meet their own particular difficulties. I. In this suburban area, the population has grown very rapidly in the last 30 or 40 years, and practically all the council schools are "three-decker" three department schools, accommodating about 1,200 children. There are selective Central Schools taking about 10 per cent of the children for a four-year course from the age of 11+. (b) will develop upon lines personal to itself, the idea being that a child leaving a Junior department would not necessarily go to the Senior department in the same building, but to that Senior department which would best serve his needs and capacities. Uniformity in Syllabus is the last thing the Authority desires: one school may develop on commercial lines, another on craftsmanship, and another on academic work only; but the bias is not prescribed. In all Senior Schools the allowance for books, etc., has been raised from 4s. 9d. [24p] to 10s. [50p] per head; and facilities for practical work are being provided upon the school premises. (a) The mere fact of reorganisation has acted as a tonic to the schools. (b) The larger number in each age-group facilitates grading according to needs and ability and, in particular, allows the abler children in the Junior Schools to extend their academic work, while remaining in an atmosphere appropriate to their other needs. (c) The promotion of children according to age rather than by attainments has emphasised the importance of their social and physical needs, and has encouraged the schools to make many experiments in the social aspects of their work. (d) The Junior Schools have gained in many ways: their aims are clearly defined, and their children develop a sense of responsibility at a much earlier age than they did when they were in the middle classes of an old type "all standard" school. (e) In the Senior Schools a real "upper school" atmosphere is more easily attained; as one Head Mistress has said, "One can do so much with older girls when there are no little girls in the way." 2 Church of England schools with 287 and 175 on the rolls. 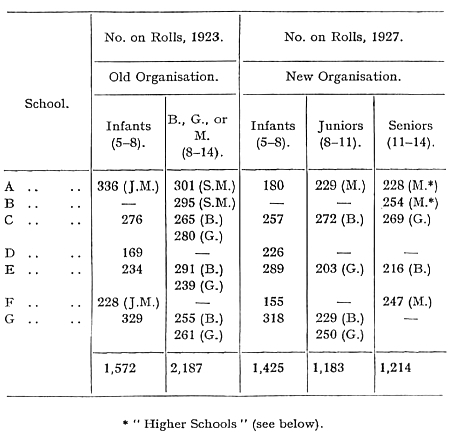 2 C. of E. schools with 239 and 152 on the rolls. There are 15 contributory junior departments, 4 council and 11 Church of England, mostly for children of both sexes. Nine of these include infants' classes and provide for all children under the age of 11; but the remainder provide for children from 8 to 11 years of age only and there are nine departments for infants only. There are, in addition, two Roman Catholic schools, one for children up to the age of 11, the other for children of all ages, but containing senior classes for all the children over 11 from the two schools. III. In this residential town, with a population of over 100,000, an almost complete reorganisation was effected in 1927. The population has been growing rapidly, and there were until quite recently many classes of 60 and even more children. An extensive building programme was therefore necessary, and the Authority took advantage of this to effect a reorganisation. There are now 9 Senior Schools, providing altogether for some 2,700 children. Two of these are selective Central Schools one for 400 boys and the other for the same number of girls; two are new Senior Schools with some 360 boys and girls respectively; while 5 Senior Schools containing some 200 to 300 pupils each have been established in existing premises. One is for boys, one for girls and three provide for both sexes, one of the latter being a non-provided Department. There are 11 contributory Departments covering the full age range from 5 to 11 and 3 Departments for infants only. These together contain about 5,400 children, most of the Departments being fairly large (400 to 600 children). Except that admission to the selective Central School is by examination, parents have a free choice as to the Senior Department to which their children should be admitted, and there is no territorial grouping. All children of 11+ are examined in February, and those who fail to reach a certain standard are transferred to Senior Schools at the end of March. The rest remain in the Junior Departments for an examination held in May for the selection of pupils for admission to the Secondary and Central School, and those who fail to be selected are transferred to Senior Departments after the summer holidays. The larger Senior Schools have three parallel courses and in all of them some classification is possible, and although the reorganisation is very recent, interesting experiments in classification and in the planning of suitable curricula have already been made. In the Junior Departments there has been some difficulty in overcoming the evil effects of the examination at 11+. This has been found to be a special danger in combined Junior Mixed and Infants' Departments, as in them pressure can be brought to bear on potential scholarship winners at a very early age. IV. This is an isolated industrial town, administered by a Local Authority responsible for Elementary Education only. There are about 5,000 children on the rolls of the Elementary schools, of whom roughly a half are in the council schools, which were all reorganised in 1926. It was not possible at that time to include the non-provided schools in the scheme, but it is hoped before long to carry out, with the co-operation of the managers, an independent reorganisation of the Church of England schools, and the provision of a Roman Catholic senior mixed department for 280 children over the age of 11+ is also contemplated. Children are transferred at the age of 11+ and occasionally at a younger age, though they generally compete for secondary school free places before transfer. The two Senior Schools already established have developed a strong senior school atmosphere. Far more out of school activities, games, sports, etc., are carried on, especially for girls, than was the case before the change in organisation. Both schools have old scholars' clubs, and have secured a better standing in the estimation of parents and of the public. Parents are keen to attend open days, and they comment freely on the terminal reports which the children take home. Both schools provide a three-year course for the slower children, while the faster stream produces a certain number of children who can complete a four-year course. There is no selective Central School. The Senior School premises include rooms for practical science, manual instruction and domestic subjects; this has led to a marked advance in the manual and domestic instruction, and the meaning and value of co-operation has been realised far more clearly by the instructors. 53. In rural areas it will, as rule, be difficult to collect enough children to form separate Senior Schools and it will more often be practicable to form Senior Divisions of the type already described. It has sometimes been the practice in County areas to remove the older children from a village school and to make them attend a neighbouring school, where there are still so few children of their own age, that the educational gain is relatively slight. 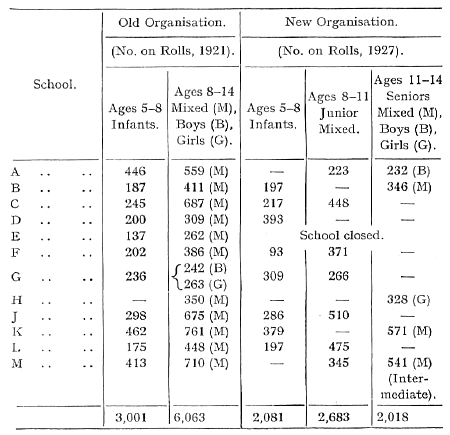 This is not the type of organisation now contemplated, but if there are enough children over the age of 11 to form a Senior Division of two, three or four classes, not only is the classification much better than that of the ordinary village school, but facilities for practical instruction can be added which will then serve all the older children of a wide area. of a few Authorities have shown that it should be possible to group schools, and so to provide greatly improved facilities for the education of the older children, over a surprisingly large part of the countryside. 55. Some County Authorities, though they recognise that each village need no longer be regarded as a self-contained unit, have not thought it possible to effect any compulsory grouping of schools or scholars. Thus, in one County mainly of an agricultural type, a number of Central Schools have been established, attendance at which is almost entirely voluntary. There is no test for admission and the Authority do not assist conveyance, and attendance from any distance is therefore confined to children whose parents can afford the cost of travelling by train or bicycle. The schools are specially staffed for giving advanced instruction and are also equipped for practical science, wood, metal and domestic work, and in most cases have gardens and school plots. They are thus able to provide a good "senior" education, usually with a suitable rural bias. There are, of course, advantages in establishing a system on a voluntary basis so that children attend a school as its reputation spreads. But on this system the head teachers do not know until the term begins how many children will apply for admission, or what their mental calibre will be. Co-operation with the contributory schools is difficult. Some teachers encourage their pupils to proceed to the Central Schools, but others, as is perhaps natural, do not. 56. In another agricultural county area a number of centrally situated schools have been equipped and staffed for practical and advanced instruction. In a few cases children have been compulsorily transferred, but most of the children attend voluntarily, and some of the schools receive no children from outlying parishes except in this way. Children travel any distance up to 7 or 8 miles to obtain the better educational facilities, the parents paying the cost of travelling by 'bus or bicycle, although the Authority contribute to the cost of bicycles in selected cases. of some inconvenience and loss, but it is dearly preferable, if it is possible, to secure the grouping of all children over the age of 11 in Senior Schools or Divisions. Any other alternative leaves the children who are not transferred in a worse plight than they were before, and the contributory schools, still retaining some of the older children, are unable to develop as satisfactory Junior Schools. 58. Some county Authorities have therefore attempted a more comprehensive reorganisation. and believe that it is possible to organise nearly all the schools of their areas in groups. They convey the older children from a group of village schools to a central town or village, establishing a School with a Senior Division where there are not enough children to form a distinct Senior School. Even a small Senior School or Senior Division can, at any rate, provide a three-year course, which would have been impossible in the contributory village school, and also facilities for practical work in a Manual or Domestic room, or in the school garden. If proper arrangements are made for travelling, meals, etc., it is found that the advantages of a Senior School education are soon understood. and that any opposition from parents soon dies away. It is the general experience that the contributory Junior Schools do more effective work than before for the younger children, and that the standard of attainment reached by children of 11 is raised. 59. A fuller account of one reorganised county area is included in the Appendix, and two shorter accounts are here given, to show the kind of experiments that have been made in rural Counties of an almost entirely agricultural character. I. In this rural county area, it had long been felt that some effort should be made to provide practical instruction for as many as possible of the older village children. This inevitably led to the collection of relatively large numbers of children of similar age in centrally situated schools, and the result has been not merely improved facilities for practical instruction, but a better all-round education. Some forty schools have been closed or "decapitated"; as a rule these have been from two to five miles from the school chosen to serve as a senior school for the group, but in two cases the distance is greater. The children are conveyed in closed motor vehicles and are supervised on the journey. have agreed to the transference of older children to Council Schools. In two small towns children coming in from the villages have the choice between Church of England and Council senior schools. The heads of the senior and junior schools confer, and their syllabuses are arranged to ensure a continuous curriculum. The senior schools are provided with manual and cookery centres, sometimes combined, sometimes separate, large enough to contain a dining-room for the mid-day meal of any children who live at a distance. Two course dinners are provided at a cost of 2d. or 2½d. [about 1p] per head for food and the meals are served in such a way that the children obtain valuable training in behaviour and cleanliness. The dinners have also played an important part in breaking down the opposition of parents, most of whom were, in the :first instance, opposed to the idea of transference, but after the transfer has taken place the opposition has, as a rule, disappeared very quickly. School games have been introduced for boys and for girls, as well as school caps and magazines, and this has all helped to change the views of the parents. The heads of both senior and junior schools have risen to the occasion and the effect on the schools themselves has so far been very good. The junior schools are in many cases so small that individual attention is necessary, but they provide a good preparation either for the Senior School or for the Secondary School, when their pupils obtain Scholarships or free places. The scheme as a whole has led to a considerable reduction in the Authority's expenditure. II. In another small County of very small rural schools, the L.E.A. provided in 1920 three Central Schools in specially constructed buildings of a more or less temporary type. They admitted all the older children from the more accessible parts of the County, except some 20 per cent of the lowest level of ability; one of them also takes selected children from the remoter part of the area, but it is hoped shortly to provide Central School facilities for all the older children of this district by co-operation with a neighbouring Authority. The children travel either by rail, in which case the fares are paid by the L.E.A., or by bicycle, in which case also the Authority meet the whole, or more commonly part, of the expense. It was originally intended that the remaining older children should attend the Central Schools one day in each week for practical instruction, but it is recognised that this arrangement is not entirely satisfactory, and it is hoped before long to collect these children into Senior Divisions in existing schools, which will probably not at first provide very good facilities for practical instruction, but will give better opportunities for the education of the children with others of their own age. numbers remaining beyond the period of compulsory attendance are not very great, few children complete a three-years' course, and some do not even spend two years in the Central School. Each of the Central Schools has facilities for instruction in domestic subjects, gardening and handicraft (woodwork and metalwork) and for practical science, and it is the aim of the curriculum to combine this practical instruction with the work in the ordinary subjects, so as to provide a good general education with a rural bias. The schools are small - 80 to 160 children each - and only in one of them is it possible to effect classification in parallel classes. The schools have been very successful in developing a strong social life and a healthy spirit, so that even the weaker pupils .enter into their work with great zest and determination; but with a short and varying period of school life, it has not been easy to produce a satisfactory course, or to adhere to a syllabus once drawn up, and there is a considerable variation in t.he level of attainment in ordinary school subjects. Some very good work is being done, and in such subjects as Geography and Science the pupils are successfully accomplishing sound work, which would have been quite impossible in an ordinary village school. 60. Even in urban areas the establishment of large Senior Schools will mean the 'attendance of some children from a considerable distance. At present this applies particularly in the case of selective Central Schools, but the practice is likely to increase, as children will willingly travel further to attend a good Senior School than they would to an ordinary Elementary School. It is also likely that Senior Schools will often be built on the outskirts of a town; not only will it then be easier to obtain an open and healthy site, but children travelling by 'bus or tram are more likely to be able to travel in comfort, than if they had to travel with the stream of workers to the business area in the centre of the town. An Authority can often do much to help, e.g., by securing special facilities for children who travel by 'bus or tram, or by providing proper storage accommodation for bicycles at the school. riding to school on ponies. If, as a result of reorganisation, any number of children has to be conveyed from one village to another the most common practice is to hire a motor vehicle. This is expensive, the experience of one Authority being that the cost amounts to some £3-£5 per child per annum varying with the distance and the numbers conveyed, But the expenditure is, as a nile, more than balanced by the savings as a result of reorganisation, and there is therefore every reason for ensuring that the transport arrangements are in every way satisfactory. The children should, if possible, not have to wait for collection at an exposed point, the vehicle itself must be weatherproof and suitable for the numbers conveyed, the driver must be competent and, unless the numbers are very small, it is as a rule found advisable to employ a conductor for supervision. 62. Partly on account of the expense of conveyance by motors, partly as a result of special difficulties with small numbers of children, some Authorities prefer the use of bicycles, though this method is naturally adopted only where roads are reasonably flat and safe. One Authority purchases machines for about £4 apiece, and hands them over to the parent in exchange for a simple receipt and an undertaking to keep the machine in proper repair. The parent may buy in the bicycle at any time while the child is attending school, at a price which falls to 2s. 6d. [12½p] at the end of 4 years of school attendance. This acts as a powerful incentive to proper maintenance, and it is the experience of this Authority that the cost of such a scheme does not exceed £1 per child per annum. In another County area a small allowance is paid to the parent for the maintenance of the machine at the rate of 6d. [2½p], and later of 1s. [5p], for every 10 attendances. In every area, where experiments have been made with the use of bicycles, the results have been satisfactory both to the Authority and to the parents. 63. It is important, where children have to travel some distance to school, that proper facilities should be provided for drying boots and clothes. Some teachers have shown great ingenuity by getting the children to construct slippers out of simple materials, so that boots may be removed for drying. 61. It is essential, where any children cannot return home during the dinner hour, that good arrangements should be made for their comfort during this time. Circular 1357 issued in 1925 drew attention to the importance of the dinner hour in rural schools, especially where schemes of reorganisation were in force, and advice is also given on the matter in Section 15 of the Board's Handbook of Suggestions for Teachers. The difficulty will not arise in rural schools alone, and there are already many urban selective Central Schools which find it necessary to provide dinners for a number of pupils. The minimum requirement is that children should have an opportunity for eating meals brought by them in comfortable surroundings and under proper supervision, and that facilities should be available for making cocoa, heating milk, etc. Many Authorities are not satisfied with this minimum, and some County Authorities arrange that proper cooked meals shall be provided in conditions of decency and comfort at every School which is attended by any number of children from a distance. A meal eaten under decent conditions is not only of great value for the physical welfare of the children, but can also provide a valuable training in cleanliness and behaviour, and the existence of a good dinner scheme is an essential factor in securing the support of parents for any scheme of reorganisation. 65. In one County area, where many of the schools have been grouped, use is made of the premises and equipment of the Domestic Subjects Centres which exist at all the Senior Schools. It is found here that good two-course meals can be provided at a cost of 2d. - 2½d. [about 1p] per head, while in another county, where separate kitchens and equipment are used, it is found that the gross cost, on a simpler and more vegetarian dietary, does not exceed 2d. per head, wherever 40 children attend daily. In both cases great use is made of the produce of school gardens, and although the detailed arrangements are in the hands of local Committees, the County Authority assists by drawing up suitable dietaries and by purchase of stores in large quantities at cheap rates. 66. In planning buildings for a Senior School, it is necessary to think out what is required to meet its own special needs, rather than to attempt to imitate too closely already existing schools, that have to serve rather different purposes, and that are able to provide a longer educational course. The most obvious requirement is the provision of Practical rooms for Manual and Domestic work, preferably as an integral part of the school premises. Many schools will have to continue to use existing centres, but wherever possible it will be a great advantage if the Practical Instructors can be members of the school staff, and if all the work of the school can be carried out on the same premises. 67. It is important, from the point of view of the economical employment of the staff, that there should be enough Practical room accommodation in anyone school to take a full class simultaneously. This will normally mean accommodation for 40 pupils or, if it is a Mixed school, the Domestic and Manual Rooms should each provide for rather more than twenty pupils, as it cannot be assumed that each class will be equally divided between the sexes. In a school of 400 pupils this will enable each class to have half a day per week in the Domestic or Manual rooms, but the accommodation will not necessarily be excessive even for a smaller school, as some of the classes may with advantage give more time than this to practical work. as it becomes more clear in what direction the school will develop most strongly. Art and Science, for example, will both take their place in the curriculum, but one school may develop a course that is specially strong in Art, while another will excel on the side of Science. The buildings should therefore be planned and equipped to leave the school free to grow as best suits its own particular needs and capacities, and the plans should, as far as possible, allow for additions to be made, if it is found later on that numbers increase, or that some further special accommodation is required. A Hall for assembly and for Physical Training when taken indoors. 2 larger class-rooms of 600 or 700 sq. ft. each [55.74-65.03m²]. Enough accommodation for Manual or Domestic Instruction to allow a full class to receive instruction at the same time. Staff Rooms, cloak rooms, etc. 70. In spite of the advantages to be derived from a specially designed building, there is no need to associate the ideals of a Senior School education too closely with the provision of new buildings, and it is surprising how well existing buildings can, with some thought and care, be adapted for new purposes. The large rooms often found in old schools will sometimes serve for the Practical Rooms suggested above (for Science Rooms, for example, if fitted with benches round the walls), while a room too small for ordinary class work may serve as the School Library for private reading and the like. Even if the Senior School is not housed on a distinct site. a separate organisation will give it an opportunity to develop its own ideals and its own corporate life, and some of the most successful reorganisations already effected have required hardly any new building. Fuller accounts are here given of five areas in which a considerable measure of reorganisation has already taken place. Reorganisation is not complete in any of the areas chosen, and these accounts are given, not as examples of ideal organisation to be copied by other Authorities, but to show what some Authorities have found possible in spite of difficulties. Naturally, in the early stages of a new experiment mistakes have been made and circumstances beyond the control of the Authorities have sometimes led to unsatisfactory features which it is necessary to criticise. These accounts would be valueless if they did not criticise where criticism is needed, but they must not therefore be taken as imputing any blame to the Authorities who have been the first to make experiments, and whose work as pioneers it is desired cordially to acknowledge. Although there had been for a. long time in this area a very efficient Higher Elementary School for Boys, the Authority decided in 1922 that the needs of the town did not call for a school of this intermediate type, but could best be met by the extension of Secondary School provision and by the reorganisation of the Elementary Schools so as to provide non-selective senior schools for all the children over the age of 11. Children are transferred annually in August at the age of 11+, except that a small and diminishing group of children who have not yet at that age completed a year in Standard IV are retained until the age of 12+. The Junior Schools that contain many backward children provide special classes with a simpler curriculum and a modified scheme of work, while those which contain many very bright children provide a special class or section to cover the last year before transfer. Many of these children proceed to Secondary Schools. Partly owing to shortage of accommodation, difficulties in connexion with transfer were very great in the transition period, but the scheme is now working smoothly. Senior Schools. The Senior Schools are organised in 10, 11 or 12 classes, i.e., 3 parallel three-year courses with one or more additional classes, which in some schools are for specially dull children and in others are used to form special leavers' classes, All the children in the Junior Schools, when they are eligible for transfer, sit for an examination consisting of a written test in English and Arithmetic, and on the results of this they are classified into A, B, and C groups in the Senior Schools, though after a short period the groups are revised. There is a separate examination for Secondary School scholarships which includes an oral test. Each Senior School has attempted in its own way to deal with the problem of providing education for children of varying abilities and interests, and in the process remarkable differences of character between one Senior School and another have developed. Different curricula are arranged for the parallel courses. French is taken by A. Forms only, and they also take Algebra and Geometry. An easier course in Mathematics is planned for B. Forms, and the C. Forms take only simple Practical Arithmetic. The C. groups have more time for practical and less for academic subjects, more oral work and less private reading, and some additional time for speech training, remedial physical exercises, etc. The courses in History, Geography and Science show very careful grading, and the schools have been specially resourceful in their efforts to make good and useful citizens of the weaker scholars by arousing an intelligent interest in natural phenomena, elementary facts of life, social and civic conditions, and some of the more obvious links with the world beyond their immediate environment and the times before their own. The courses in English vary a good deal. One school has made a special feature of Drama, another has established a useful progressive course in Composition, leading up gradually to the writing of essays and the power to take part in debate. In another school the language training of the C. groups is put into the form of tests of intelligence. Each school in planning a course of Arithmetic for the C. groups is baffled by the failure of the children to understand simple written language sufficiently accurately to be able to work a problem. associated with that in domestic subjects and in needlework. The girls studied, designed and executed many things to be used in a home and they have redecorated the rooms in the Housewifery Centre. Another School has established a successful Biology course, which attempts to arouse an appreciation for the animate world, to teach reasons for rules of health and to develop a scientific method of study. In another school an attempt is being made to plan a course of instruction in Elementary Science which will form a definite background to courses in Cookery and Laundry. A boys' school has a useful course for the C. Forms in everyday Science, which makes a strong appeal to boys' interests and includes' useful experiment and instruction in home repairs. Another boys' school has arranged for an extensive course in Gardening as part of the training for the C. scholars. A girls' school is contemplating an interesting course on "School and the Home", and it is hoped, if the scheme is found to be practicable, to carry further the training of the girls in the knowledge and care of young children, by making a definite connexion between the leavers' class and a nursery class so that girls may receive some real instruction in matters connected with the care of the home. The time-tables for C. scholars allow a generous amount of time to be devoted to practical subjects, but the work is planned so as to take its proper place in the development of the pupils' powers and not merely to provide an attractive and easy alternative. There has been an obvious advance in the attitude to such subjects as Art, Music, Needlework, Cookery and Laundry, and a desire to minimise their recreative quality and to increase their practical and educational content. The A. groups have naturally, though perhaps a little unfortunately, turned towards a Secondary School type of course and there is a marked desire in certain cases to work for public examinations in spite of official discouragement, and various certificates have been gained.' At some schools short courses in Shorthand, Bookkeeping, Typewriting. etc. have been introduced to meet the strong demand for such training from pupils who wish to take up a business career. But the most novel and enterprising schemes are those connected with the training of the C. scholars and Head Teachers have not so far been equally successful in their efforts to devise for the A. and B. groups courses of instruction suited to their attainments and at the same time duly related to the types of employment likely to be adopted by the majority of the pupils. The schools have been very successful in building up traditions and a senior school atmosphere. All have Houses, Prefects, Old Scholars' Guilds, school games, etc., and many of them arrange excellent school visits, and journeys, and there are several good school choirs. There are Guides and Folk Dancing parties and Dramatic Societies, and in more than one school lectures and addresses have been given by visiting speakers. have extraordinary advantages over the other older children. The other schools cannot contrive special courses for their older scholars because of small numbers. It is necessary in some cases to teach Standards VI, VII and ex-VII in the same class, and in other cases, though there are separate classes, they are taught in the same room. The consciousness that the senior schools are doing experimental work has led to a great increase in interest amongst teachers. There has been far more co-operation between Head Teachers and Assistants, there are frequent staff conferences and it is quite usual for the specialist teacher or teachers to draw up the schemes of work in their own subjects or to bring certain aspects of their subject to the notice of the other members of the staff. This pooling of gifts, qualifications and experience for the good of the school is far removed from the old system under which a Head Teacher drew up a scheme of work and presented it without discussion for the use of the staff. Junior Schools. The junior schools have still some way to go before discovering the best methods for the achievement of their special aims. In the infants' schools there is now much greater freedom and method and far more individual grading than formerly, and the same freedom and the same careful grading is found in the senior schools; but the junior schools are left as the place where solid grind is necessary to bring on the "late developers" handed on from the infants' schools, and to lay the foundations for a widely diversified course in the senior schools. The junior schools also find it difficult to attract teachers of special gifts. The existence of a universal examination taken at the age of 11 has undoubtedly led to some cramming and hurrying and to an insistence on the 3Rs as the main work of the school and though much excellent work is done in the A. groups, the teachers consider it to be a perfunctory matter to divide the children into A. and B. groups if all are to do the same examination papers at the end of the course. Thus, the B. groups usually lag behind while working on the same syllabus as the A. groups and in spite of very patient teaching struggle with the 3Rs with but indifferent success throughout the Junior School course. Many of these children develop wonderfully later on in the senior schools, either by a severe insistence on concentration (which is not so possible with young children), or by loyalty to and interest in their new surroundings. These problems in the junior schools are now being faced and the teachers are beginning to get away from the influence of the general examination. Every junior school is provided with a good little library. Increasing demands are being made for handwork materials, and the teachers are showing in other ways that they are now seriously thinking out for themselves, how best to plan out an educational course for the different groups of children for whom they are responsible. senior school. The town covers an area of some 12 square miles, and the schools contain some 30,000 children. Reorganisation of Council Schools has therefore been carried out district by district in easy stages, being begun in 1922 and being now completed in four of the five districts into which the area is divided for this purpose. Some of the non-provided schools have not yet been brought into the scheme, but two groups of Church of England schools, covering the central district, have been completely reorganised on the lines adopted for Council schools. When the first reorganisation was carried out in 1922-23, there was considerable opposition from the parents, and its success was appreciably delayed on this account. Subsequent reorganisations in other districts have met with no difficulty as the idea is now established in popular favour. 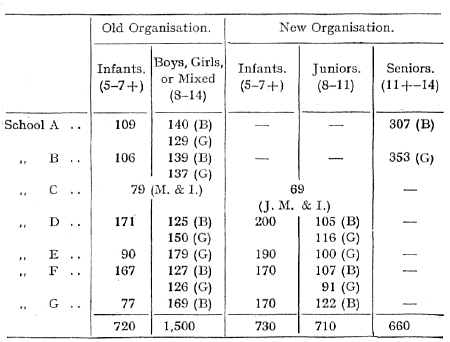 The following tables show the reorganisation (A) of two groups of Council Schools reorganised at different dates between 1922 and 1927; (B) of one of the two reorganised groups of Church of England schools. (1) Infants' Departments are left exactly as they were so that the travelling of very young children shall not be disturbed. (2) Separate Departments are instituted for children above the Infants' stage up to the age of 11+. All who are over the age of 11 years on the 31st July in any year, pass forward automatically from these Junior Departments to some kind of Senior school in the following month. The arrangements for admission from the Infants' Department are not on so strict an age basis, but, with the necessary variations on account of different conditions of accommodation, transfer is normally made at the age of 7+. (3) Roughly 15 per cent of the output of the Junior Schools pass into Secondary Schools, 15 per cent pass into Intermediate Schools, and the remaining 70 per cent go to Senior Schools. It is difficult in some years to find enough children sufficiently meritorious in the annual examination to be considered worthy of an Intermediate School education, so that the intake varies both in quality and quantity. Intermediate Schools. When some 30 per cent of the output has to be selected for Secondary or Intermediate Schools, the selection is necessarily very difficult and it is inevitable that many mistakes are made in sorting the children, and that some children are admitted to the Intermediate Schools who are not of a sufficiently high standard of ability. Theoretically, arrangements exist for subsequent adjustment, but although a few transfers have taken place at a later age from a Senior school to an Intermediate school, the reverse movement never seems to occur. Experiments in regard to curriculum are still being made in the Intermediate schools, and they will no doubt evolve in time a type of course suited to their special circumstances, though it may in the process be found necessary to modify in some respects the selective principle, e.g., by selecting only those children who are willing to take a course longer than the normal. Hitherto, the schools have aimed at providing a three-year course, though many children complete only two years. The curriculum has copied rather closely that of Secondary schools, and the boys get no manual instruction, although the large majority go direct into industry, many into one branch or another of Engineering. The classification within the schools has been on the basis of attainment, though clearly the syllabuses for the different groups should have some relation to the probable length of school life, e.g., there are obvious objections to the inclusion of French or Advanced Mathematics in the syllabus for two-year pupils, and in fact a number, having started French, have subsequently dropped it. With the less advanced pupils the low standard of attainment in English has been found a great handicap to progress in learning a foreign language. Most of the teachers in these schools specialise in one or two subjects in addition to being responsible for a form, and each school has also one or two specialists, e.g., for French or Science, in addition to the form teachers. The schools have developed strongly on the social and personal side, but it is difficult to justify the provision of selective schools on so extensive a scale, bearing in mind: (1) That some 15 per cent of the children leaving the Junior Schools pass to Secondary Schools; (2) that many of the children admitted to the Intermediate school! are not of a mental standard markedly superior to the average; (3) that the ordinary Senior schools are organised so as to provide good facilities for Advanced instruction; (4) that the school life is little or no longer than that in an ordinary Senior school; (5) that concentration on more academic subjects, though natural in a school recruited by a selective examination, prevents the adoption of a curriculum suitable for pupils leaving before the normal Secondary school leaving age, and already interested in the more practical side of life. Senior Schools. The Senior schools are all organised as to provide two or three parallel classes in the first and second years, or where the schools are mixed, at least two classes for boys and two for girls. As many of the children do not complete the full three-year course, the number of classes is sometimes reduced in the third year. The working of the scheme during the last four or five years has brought home very strongly the need for widely differentiated curricula for pupils of the highest, medium, and lowest levels of attainment. One great advantage of the new system has been that the duller children have been rescued from the lower standards in which they used to remain until the end of their school life, and have enjoyed a curriculum much better suited to their needs and capacity. There was at first an unfortunate tendency for the duller groups to be labelled as such, with the result that both teachers and children were somewhat discouraged, but this is gradually being overcome. The schools are still experimenting with different schemes of work. The class teachers are to some extent specialists, and though no additional specialists are employed in these schools, the teachers obtain free periods when the children receive manual or cookery instruction, which is given sometimes at centres, but more often on the school premises and as a rule by specialist teachers. Efforts have been made to co-ordinate this work with the work in the ordinary school subjects, much of which is approached from the practical point of view. Junior Schools. The establishment of Junior Departments under separate Head Teachers for the children between the ages of 7 and 11, has resulted in the concentration of attention on the special needs of this stage, with very beneficial effects upon the work and training. A central school, originally established as a higher standard school, was opened in 1911 with departments for boys and girls, and a second pair of departments followed in 1914. It was hoped to add a third pair, bringing the number of central school places up to about 2,200 which, with some 100 free places available annually in secondary schools, would be sufficient to provide accommodation for almost all the senior children in the accessible parts of the town. Unfortunately, it has not yet been possible to erect this third pair of departments, and it has therefore been necessary to select children by examination for entrance to the central schools and to leave those who fail, about one-third of the whole number, in the ordinary primary schools. 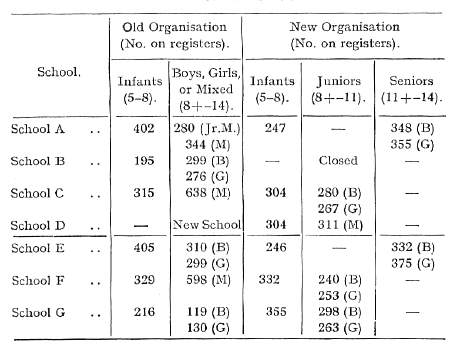 From 1914 to 1922 these contained no class above Standard 5, and the examination thus became in practice a test as to whether children had passed satisfactorily through that standard; backward children who remained in the primary schools never passed to any higher work, while the entrants to the central schools ranged from young children who passed on in a few months to the secondary schools, to children two years older with a short school life before them. Children who were not likely to stay at least a year were, however, not admitted. The drawbacks of this system, which was forced on the Authority by the difficulties of the War and the post-War period, were fully realised and in 1922 the central school examination was combined with that for scholarships and free places at secondary schools, which was conducted on the usual age basis. The educational year was also altered so that successful candidates passed from the primary schools either to the central or to the secondary schools after the summer holidays. 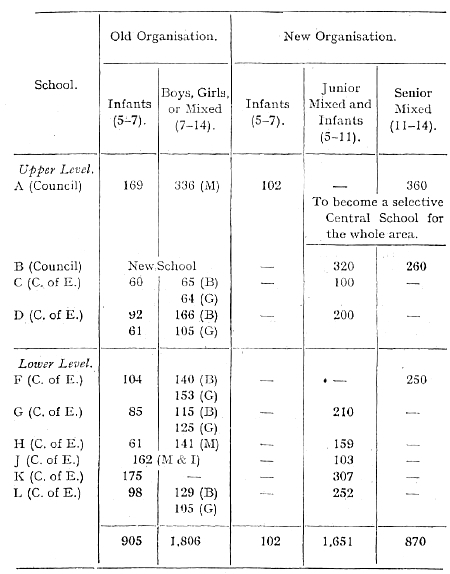 Even so, however, the organisation of the central schools has not been a very easy matter, for since not more than two-thirds of the children of suitable age can be admitted, there is always some uncertainty as to whether admission ought to be confined to the younger children, with a prospect of spending at least two years in the central school, or whether in some cases older children should be admitted, so as to give as many as possible the benefit of at least one years' instruction under central school conditions. But apart from these difficulties the conditions in the central schools, which were in intention non-selective, approximate closely to those of genuine non-selective senior schools. The majority of the children secure only two years' school life, though there has in the past two years been a distinct increase in the numbers remaining for a third year. Each of the two central schools contains independent boys' and girls' departments with accommodation for 360 pupils. The buildings were specially designed for central school purposes; in the girls' departments there is accommodation for instruction in cookery and laundry work, besides a practical room equipped for science and needlework, and in each of the boys' departments there are woodwork and metalwork rooms, an excellent laboratory and a room specially adapted for art. The classes are seldom larger than 40 and are halved for practical instruction, and each school staff numbers 11 or 12 teachers, including teachers of special subjects. The staffs are, as a matter of policy, composed partly of specialist teachers, generally graduates, and partly of ordinary class teachers of experience. There has not yet been any very great call for work with a specialised bias, as girls are not here employed in industry in any large numbers, and most of the boys go into occupations which admit of little special preliminary training in school. There have, however, been a few experiments. In three of the four departments French is taken on a fairly large scale, and one of the boys' departments divides its third year into a commercial and all industrial side, the former taking French and shorthand and the latter specialising in manual work. A few pupils remain for more than three years and two of the departments have presented candidates for the Cambridge Local Examinations to meet the needs of employers who demand examination qualifications. But the schools aim generally at a wide and cultural interpretation of elementary education as the phrase is commonly understood, and, at least in English and mathematics, the approach and the methods used are distinct from those generally employed for examination purposes. In the ordinary junior schools in the town, special classes have been organised since 1922 for those children who do not proceed to the senior schools, and every effort has been made to get them to approach their work in a manner appropriate to their age. Instruction in domestic subjects is given to all the older girls, but it has only been found possible to provide regular handicraft instruction for a few of the boys, and the work of these senior classes in junior schools has been much hampered by pressure on the accommodation. the results of the examinations are not used as conclusive tests of the work of the schools. Some minor difficulties have indeed arisen between the different departments, but these are partly due to the fact that, since difficulties of accommodation have prevented the transfer of all children at a fixed age, it has been difficult to establish a clear conception of the part that each department should play in the child's intellectual life. No additional accommodation was provided, and the schools are so close together that no hardship was involved to any children transferred from one to another. Careful steps were taken before reorganisation to work out details very closely with Managers and Head Teachers, and the Press was helpful in educating public opinion as to the purpose of the changes proposed. out of 489 children in Standard III, 276 over 10, including 74 over 11.
out of 322 children in Standard III, only 181 children over 10 (of whom only 12 are over 11). The Infants' departments cover a three-year course including the work of Standard 1. Schools for Older Children. There are three Senior schools, one for boys and one for girls, and one Mixed, which take three-fifths of the older children, and two "Higher Schools," which take the children of superior intelligence selected by an examination. The Senior schools suffer somewhat from an undeserved reputation for being schools for duller children, but this is being lived down. It is unfortunate that, while the "Higher Schools" possess their own facilities for practical instruction, most of the senior school children have to attend Centres for this work, as a certain loss of status is inevitable when inferior facilities are enjoyed. The Senior Schools do not contain enough rooms for parallel courses but the children are graded out as far as possible, special syllabuses being drawn up to meet the needs of the children of more limited attainments, e.g., Household Arithmetic for a class of dull girls in their last year. Specialisation of staff is found possible, though it is only used to any great extent in one of the schools. It has at times been found difficult to secure good teachers for the Senior Schools, because it has been thought that the classes would be specially difficult. Each of the Higher Schools has full facilities for practical instruction, both for boys and for girls, and also for the teaching of Science. There is full specialisation of the teaching staff, and the children move forward steadily from year to year through a three-year course. French has recently been included in the curriculum and Mathematics are well taught. A few pupils are transferred each year to Secondary Schools, and it seems clear that the curriculum is a help to these scholars. Both the Higher Schools are Mixed, though this is due to reasons of expediency and not to any special design, and it is possible that one will eventually become a school for boys and the other a school for girls. The Junior Schools. These comprise parallel classes with a differentiation of syllabus, and this principle could be followed up more thoroughly if all the schools had rooms in multiples of three, but the best is made of existing conditions where there are, for example, 5 rooms. The short age range covered by these schools has the effect of gaining early attention for the backward children, who are studied from the very first. The course leads up to an annual general examination in English and Arithmetic, the effect of which on the schools is distinctly good. There is no cramming and no serious forcing of the children, although a danger of this undoubtedly exists. All children between the ages of 10 7/10ths and 11 6/12ths are examined in whatever standard they are placed, and thereafter pass forward to some form of post-primary school. Life within the Junior Schools is happy, and cultural subjects, such as Music and Drawing, are better taught than they were before. There is no difficulty in obtaining good teachers for these schools. Special tests have shown that in the A. Forms and in Standard IV generally the children can do work in advance of that usually associated with their age. A scheme has been drawn up for reorganising nearly all the schools in the county in 46 groups, in each of which Junior Schools would feed a Senior School in a central town or village. The population is so thinly scattered that only in 8 cases is it contemplated that the Central School should be a distinct school for senior children. In the other cases a Senior Division has to be established within a School taking children of all ages. A very large proportion of the Schools in the County are non-provided Schools and, if the scheme is completed as planned, 6 of the 8 Senior Schools and 30 of the 38 Schools with Senior Divisions will be Church of England Schools. The scheme is based on the whole-hearted co-operation of the Diocesan authorities and of the various bodies of Managers, who are doing their best to provide suitable premises where improvements or extensions or new buildings are required. Progress has been helped by generous gifts of sites in two cases from private persons, but the provision of suitable Senior Schools or Divisions necessarily requires time. The scheme is developing slowly, partly for this reason and partly because it is the policy of the Authority not to carry out reorganisation until there is a prospect of providing satisfactory accommodation at the Senior School in question, and until the Managers and others concerned are convinced of the advantages to be derived from the change. Great pains have been taken to explain and discuss details of the scheme with managers, teachers and parents, and in no case has the Local Education Authority yet found it necessary to give directions for reorganisation or grouping under Section 34 of the Education Act, 1921. Conveyance of the children has usually been arranged by contracting for a vehicle, but in some parts of the area it has been found more economical to use bicycles. Bicycles are only provided where parents raise no objections, and where roads are reasonably flat and safe. Utensils and equipment are provided by the Local Education Authority at the Senior Schools, so that dinners may be eaten in comfort, and arrangements are made to secure supervision. Most of the schools have facilities for drying wet clothes, and in some felt slippers have been made to be worn in school when boots are wet. (1) The children are much better graded in classes. In the smaller Senior Divisions there is not always one class for each year group, but this ideal is much more nearly attained than before. In one Senior School it has been found possible to provide a separate class for backward children, and this is contemplated in several of the larger Senior Schools not yet established. (2) The older children enjoy far better facilities for Games and for Practical Work (i.e., Handwork, Gardening, and Domestic Subjects). (3) Improvement is already noticeable in the preparatory work of the Junior Schools. A special report has been drawn up by an Advisory Committee and circulated by the Authority, which, without in any way depriving the schools of their initiative, seeks to give definite guidance on rural school problems, such as the standard of attainment to be the aim of the junior schools, and the type of course to be followed in the senior schools. Special stress is laid on the importance of securing close contact between senior and contributory schools, and of regarding the group and not the single school as the unit. No definite syllabuses have been drawn up, as this is regarded as the function of the Head Teacher, but much useful material has been collected to assist teachers in drawing up schemes of work designed "to relate the various subjects to each other" and "to introduce practical work closely connected with the rest of the instruction". The aim is to give an education "varied and enriched by reference to environment" without "introducing a rural bias to the exclusion of essential subjects", but the practical instruction is to consist mainly of training which will be definitely useful in country life, e.g., the boys could learn in the workshops how to make gates and hurdles and how to build and repair gates, fences, fowl houses, chicken coops, etc. 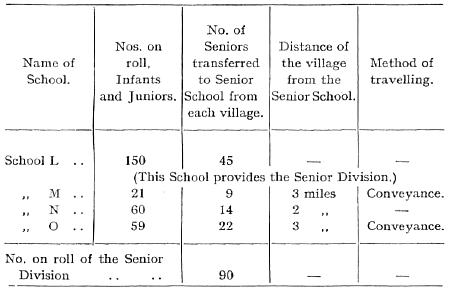 It is the definite policy of the Authority to provide an adequate and well qualified staff for the senior schools, but reductions have been possible in the staffs of the junior schools, and a number of small schools have been closed, with the result that there is a considerable net saving, after allowing for expenditure on conveyance, and in spite of the great advantages secured for the children. No.4. School Doctors in Germany. By W. H. Dawson. (1908.) Price 6d. No. 13. The Problem of Rural Schools and Teachers in North America. By Ethel H. Spaulding. (1909.) Price 6d. No. 17. Report on Science Teaching in Public Schools represented on the Association of Public School Science Masters. By Oswald H. Latter. (1909.) Price 4d. No. 18. Compulsory Continuation Schools in Germany. By H. A. Clay. (1910.) Price 9d. No. 19. The Course System in Evening Schools. By H. T. Holmes. (1910.) Price 3d. No. 21. A School Week in the Country. Bradford, Grange Road Secondary School, Girls' Department. (Educational Experiments in Secondary Schools, No. ii.) By Miss Mary A. Johnstone. (1910.) Price 4d. No. 23. The Training of 'Women Teachers for Secondary Schools. A series of Statements from Institutions concerned. (1912.) Price Sd. No. 25. Report on Farm and Agricultural Schools and Colleges in France, Germany and Belgium. By R. B. Greig. (1912.) Price 2d. No. 26. Education and Peasant Industry. Some State and State-aided Trade Schools in Germany. By Edith Edlmann, (1912.) Price 5d. No. 27. The Playground Movement in America and its relation to Public Education. By Walter Wood. (1913.) Price 4d. No. 28. Report on the Teaching of Greek at the Perse School. Cambridge. (Educational Experiments in Secondary Schools, No. iii.) (1914.) Price 1s. No. 29. The Experiment in Rural Secondary Education conducted at Knaresborough (Educational Experiments in Secondary Schools, No. iv.) (1915.) Price 4d. No. 30. An Experiment in Industrial Research, By Thomas Lloyd Humberstone. (1915.) Price 4d. No. 31. A Rural Special Subjects Centre. (1915.) Price 1d. No. 32. The Admiralty Method of Training Dockyard Apprentices. (1916.) Price 1½d. No. 33. The Universities of the United Kingdom of Great Britain and Ireland. A Handbook compiled by the Universities Bureau of the British Empire. (1918.) Price 9d. No. 34. Report on the Sheffield City Museums. By Sir F. G. Ogilvie, C.B. (1919.) Price 6d. No. 37. The Teaching of History. (1923.) Price 6d. No. 38. The Practical Management of Small Live-Stock in connection with the teaching of Rural Science in Elementary Schools. (Elementary School Series, No. iii.) (1922.) Price 6d. No. 39. Notes on Camping. (1923.) (Revised Edition.) Price 1s. No. 41. The Botany Gardens of the James Allen's Girls' School, Dulwich: Their History and Organisation. (Educational Experiments in Secondary Schools, No. v.) (1922.) Price 2s. No. 42. Report on the Experimental Course in Music at the Mary Datchelor School, Camberwell. (Educational Experiments in Secondary Schools, No. vi.) (1923.) Price 4d. No. 43. Humanism in the Continuation School. (1921.) Price 1s. 6d. No. 44. Mental and Scholastic Tests among Retarded Children. An enquiry into the effects of Schooling on the various tests. (1923.) Price 1s. 3d. No. 45. The Teaching of Drawing in a Secondary School. Being the development of intelligence through form and colour. (1924.) Price 1s. No. 46. Rural Education. Adaptation of Instruction to the needs of rural areas. A survey of the present position. (1926.) Price 6d. No. 47. The Position of French in Grant-aided Secondary Schools in England. (1926.) Price 9d. No. 48. The Work of Men's Institutes in London. (1926.) Price 3d. No. 49. Survey of Technical and Further Education in England and Wales. (1926.) Price 1s. No. 50. Some account of the Recent Development of Secondary Schools in England and Wales. (1927.) Price 6d. No. 51. Memorandum on Libraries in State-aided Secondary Schools in England. (1927.) Price 3d. No. 52. School Pictures. (1927.) Price 4d. No. 53. Secondary Education in Ontario. (1927.) Price 1s. 6d. No. 54. Report on the Provision of Technical Education for the Rail Carriage and Wagon Building Industry. (1928.) Price 4d. No. 55. Report on Music, Arts and Crafts, and Drama in Training Colleges. (1926-27.) (1928). Price 6d. No. 56. Secondary Education in the States of New York and Indiana. (1928.) Price 3s. 6d. No. 57. Memorandum on the Teaching of Building Science to Students attending Courses of Instruction in Building and the Building Trades. (1928.) Price 3d. No. 58. Report on the Teaching of Electrical Machine Design. (1928.) Price 3d. No. 59. Report on Adult Education in Yorkshire. For the period ending on the 31st July, 1927. (1928.) Price 1s.